I’m happy to recommend two books that I’ve recently added to my shelves on Minneapolis history. Two recent additions to my Minnesota history book shelves. Fore! Gone. 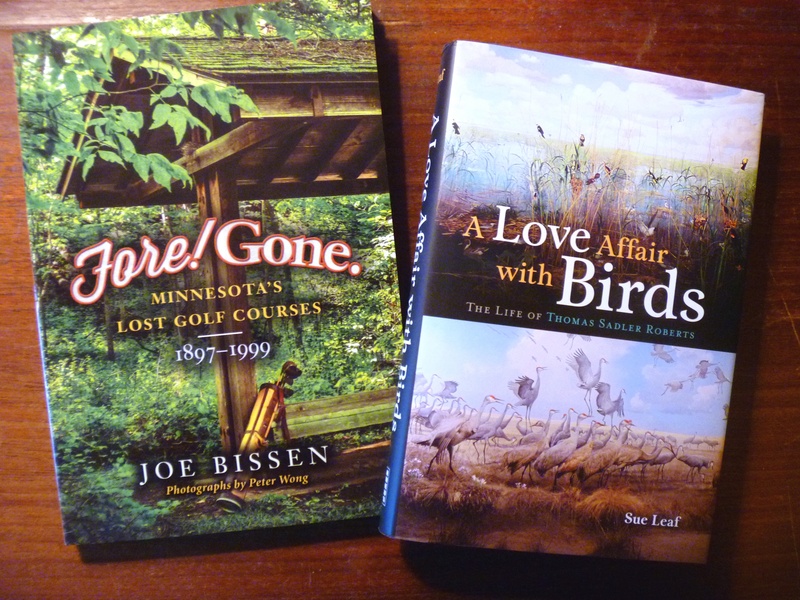 Minnesota’s Lost Golf Courses 1897-1999 by Joe Bissen. Joe contacted me after reading my pieces on the old Bryn Mawr Golf Club before it spun off Minikahda and then Interlachen. We ended up spending an enjoyable morning roaming around the Bryn Mawr neighborhood trying to pin down the location of the course and the clubhouse. It was a task made more difficult by the changes in street names and house numbering systems over the last 115 years. Bryn Mawr is only one of many long-gone golf courses that Bissen writes about in this entertaining book. If you’ve played much golf in the state, you’ll find these stories especially enjoyable, but you needn’t be a fan of “a good walk spoiled” to enjoy these stories of changing landscapes. For Minneapolis history buffs, I’d recommend a visit to Joe’s blog as well, where he goes into greater detail on his search for more info on the ancient Camden Park Golf Club that was supposedly built around Shingle Creek by employees of C.A. Smith’s lumber company. A Love Affair with Birds: The Life of Thomas Sadler Roberts, by Sue Leaf. The wild landscape north of Lake Harriet, which is named for Thomas Sadler Roberts, is widely known as a bird sanctuary in the Minneapolis park system. What is probably less-well known, is that the entire Minneapolis park system is a bird refuge — and has been for about 75 years. Roberts was a doctor and later in life an ornithologist at the University of Minnesota who was instrumental in creating the fabulous displays at the Bell Museum of Natural History at the U. When I was still in grade school in the 1960s I remember my parents taking us to see those displays on Sunday afternoons. I don’t think they are as heavily visited now as they once were, but I had such fond memories of those life-like exhibits that I took my daughter there several times in this century. A couple of years ago I included in this blog a photo of wolves attacking a moose outside the museum. Now, thanks to author Sue Leaf, I know the story of how the Bell Museum came into existence — as well as many other details of the life of a remarkable man. Leaf places Roberts’ life in the context of the early history of Minneapolis. His friends, colleagues and benefactors included many influential people in the creation of the city’s economy and institutions. The story Leaf tells heightens appreciation for the wildlife habitat that Minneapolis parks have preserved not only in the Thomas Sadler Roberts Bird Sanctuary, but throughout the park system. I hope you will keep both books in mind for your book-inclined friends and family this gift-giving season. Or buy one for yourself and save it for a day when you’re snowed in. Sorry, but you know it’s coming. Post script: Check back in a couple days and perhaps you can help us solve a mystery in Thomas Sadler Roberts Bird Sanctuary. Thanks for the kind words! I loved piecing together the natural history of Minneapolis, resurrecting the tamarack bog, oak savannah and passenger pigeon colony.